Digital pulse-width modulation (PWM) is used to encode a nonconstant-envelope signal into a train of rectangular pulses with varying widths, such that the information lying in the amplitude of the input signal is represented by the widths of the pulses. Pulsed signals can be used to drive the power ampliﬁer in burst-mode RF transmitters. After ampliﬁcation, the desired signal, which is the ampliﬁed passband equivalent of the input to the pulse-width modulator, has to be recovered by a bandpass ﬁlter. However, when generating PWM digitally, a considerable amount of distortion can be observed in and around the band of the desired signal, which prevents perfect signal recovery after ampliﬁcation. Therefore, conventional PWM is unsuitable for the use in burst-mode RF transmitters. In our work we analyze PWM mathematically. We use a Fourier series to obtain an analytical closed-form equation completely describing the PWM process. With that equation, we can show that the undesired distortion in digitally pulse-width modulated signals originates from aliasing. Making use of this knowledge, we propose a bandlimited pulse-width modulator that does not suffer from aliasing and is therefore suitable for creating the driving signals in burst-mode RF transmitters. The ﬁgure above compares the PSD of a pulsed signal generated with conventional PWM to the PSD of a signal generated with bandlimited PWM. It can be seen that the bandlimited PWM does not contain destructive aliasing in and around the band of the desired signal. 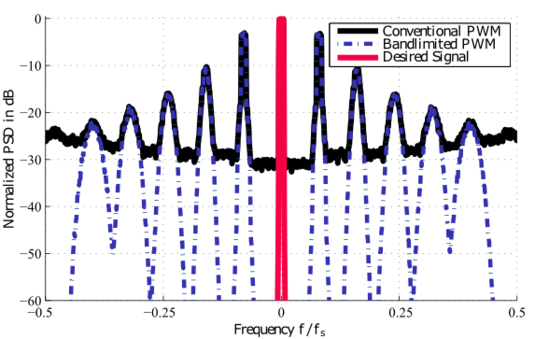 More detailed information can be found in our paper ”Aliasing-Free Digital Pulse-Width Modulation for Burst-Mode RF Transmitters” (published in IEEE Transactions on Circuits and Systems I).